Is the old tried and true beginning to fade away as new-fangled equipment arrive on the scene? The heavy bag is a contender that stands the test of time. It’s sophistication may not compare to the levers and pulleys, angles and dangles, of all sorts of contraptions meant to build, isolate and build, give range of motion to, and stretch muscle. But, man what an awesome, systemic workout you can get from this simple and effective non-machine. The typical. heavy bag is a stuffed bag made of leather or vinyl. They weigh anywhere between 50 and 100 pounds. Boxers use them to build punching power, ant to improve their boxing technique. Other marshall artisis will also use the heavy bag to train, improving their punchig power and speed as well as improving the delivery of speedier and more powerful kicks. Beating on a heavy bag is definitely a physically demanding activity that will challenge your stamina and your strength. This training is both anaerobic (higher intensity) as it is aerobic as long as the session lasts for a minimum of two-minutes. 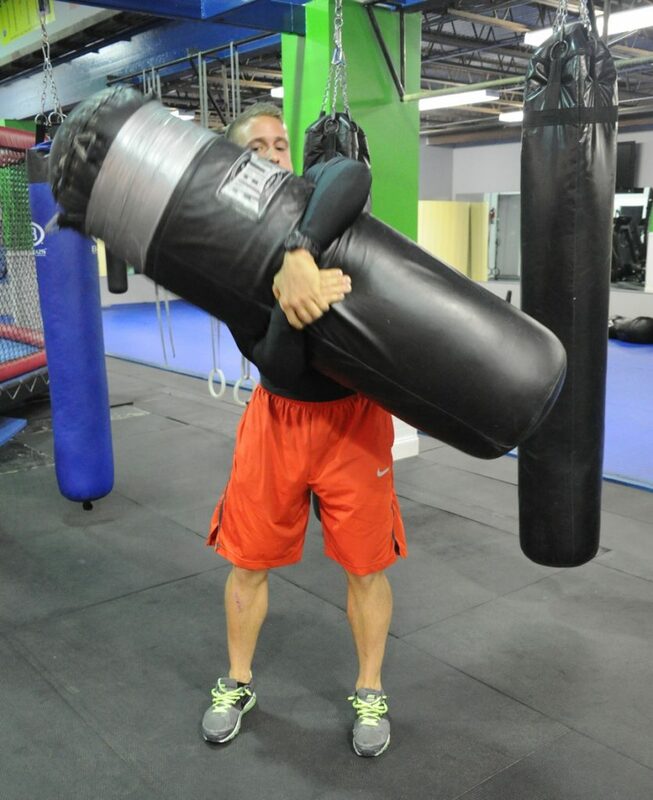 Training on the heavy bag can greatly tax the cardio respiratory system, if it is done at the right intensity. As you move around a bag, changing body-position, you will start to utilize a great amount of oxygen. This is what makes it an aerobic workout. Pros will work the heavy bag, keeping up a high intensity of punching and moving for at least three-minutes. If it can be sustained, try to box the heavy bag for a five minute round. This is a thorough aerobic workout. This training will improve power, and this power can give you the edge in a self defense situation. With enough practice, although tough to measure, your power could increase to a point where one punch or kick could incapacitate an attacker. The heavy bag will develop muscle mass and power in areas including the shoulders, arms, chest and back. The legs and especially the waist get a good workout as you twist to throw punches and move around the bag. As you throw what is known in the sport as a straight punch, for example the right cross and jab, you will develop power throughout the chest and in your shoulder muscles. Uppercuts and hooks will focus on the muscles in the back and arms. So, when working out on the heavy bag be sure to mix it up. Breathe correctly and don’t be afraid to utter some grunts or yells as you deliver these muscle increasing blows. What a stress reliever! If it helps, duct tape a picture of your boss’ face to the bag, it can save some wear and tear on the imagination. This entry was posted in Training and tagged Anaerobic Training, Bodybuilding, Bodybuilding Training, Heavy Bag Training, Heavy Bags In Training, Intensity Training, Training Tips, Weight Training. Bookmark the permalink.